Sardonyx is a variant of Onyx in which the coloured bands in shades of yellow, Green, brownish-red may have some black colour. 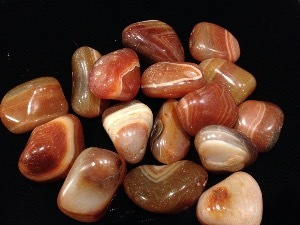 Sardonyx is said to a stone of strength and protection. It may invoke the search for a meaningful existence and promotes integrity and virtuous conduct. Sardonyx may bring lasting happiness and stability to marriage and partnerships, it may also attract friends and good fortune. Psychologically, Sardonyx supplements willpower and strengthens character. It may increase stamina, vigour, and self-control. This stone alleviates depression and overcome hesitancy. Mentally, Sardonyx is considered to improve perception and aid the process of osmosis and processing of information. Sardonyx Red tumbled to a smooth finish, an ideal pocket size stone, small enough to carry around with you. Tumble Stones can also be placed around the home for their energies or can just be nice decorative items. 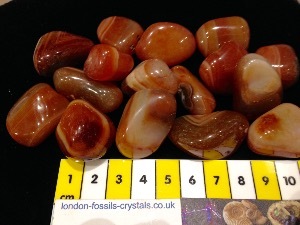 Sardonyx crystal gemstones of varying sizes selected specially for your order.